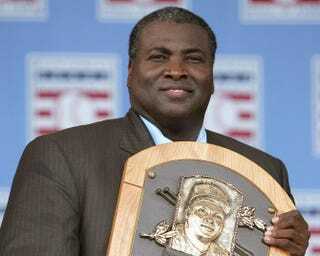 Inductee Tony Gwynn poses with his plaque at Clark Sports Center during the Baseball Hall of Fame induction ceremony on July 29, 2007 in Cooperstown, New York. Tony Gwynn, the Hall of Fame slugger whose career netted a lifetime batting average of .338 and some 3,141 hits over 20 seasons with the San Diego Padres, lost his fight with cancer on Monday, ESPN reports. According to ESPN, Gwynn 54—who won eight National League batting titles and played in both of the Padres' only World Series appearances—died early Monday morning at Pomerado Hospital in Poway, Calif., surrounded by his family. Gywnn was the San Diego State baseball coach but had been on medical leave since March. He had been the coach at his alma mater since 2002, ESPN reports. Gwynn, nicknamed "Mr. Padre," was voted into the Pro Baseball Hall of Fame in 2007, his first year of eligibility. The Padres retired his number, 19, in 2004. "Tony will be remembered in baseball circles for his hitting acumen, as evidenced by a lofty .338 lifetime batting average and an astonishing eight National League batting titles," Jeff Idelson, president of the National Baseball Hall of Fame and Museum, said in a statement viewed by ESPN. "But it was his infectious laugh, ever-present smile and humble disposition that made Mr. Padre a favorite in San Diego and an endearing figure to a nation of baseball fans who marveled at his career accolades and celebrated his 2007 induction into the Hall of Fame in record numbers."